The Judeans recognized Jesus as the prophet of God and we think, “He was much more than that. Jesus is the Son of God.” Yet the Judeans weren’t wrong – Jesus was a prophet and a remarkable one at that. These days just about anyone can call themselves a prophet and we don’t think much of it. But in Biblical times there was a high standard: To be a prophet of God meant prophesying with 100% accuracy (Deu. 18:20-22). If someone prophecies or foretells an event that doesn’t come to pass, they weren’t speaking for God, because God never lies. In scripture, Jesus is called the prophet. He is the ultimate Prophet to whom the other prophets pointed. Yet in nearly 50 years of church-going I don’t think I’ve ever heard a sermon entitled “Jesus the Prophet.” Have you? Perhaps it’s because we think the label is demeaning. “Better to call him Lord than prophet.” But if we paid more attention to the prophecies of Jesus the Prophet, we would be less susceptible to the misleading claims of false prophets. Jesus said it. It happened. That settles it. Obscure prophecies, like the one about the eagles gathering around the carcass (Matt. 24:28), seem strange to us. We have no idea what Jesus was talking about. But his meaning would have been perfectly obvious to a Judean living in the first century. It’s the same when Jesus is talking about shortened days and fleeing to the mountains. These prophecies seem mysterious to us, but those who heard them and saw them fulfilled knew exactly what was going on. The prophecies of Jesus were as plain as day and those who heeded them were saved by them. You probably know that Jesus predicted the destruction of Jerusalem and the Temple, but what you may not know is that Jesus painted a very detailed picture of when, where, and how that destruction would unfold. He was not vague. In fact, Jesus made no less than 40 predictions in connection with that event – that’s 40 signposts even Blind Freddy could see. Yet we don’t see the signposts because they are obscured by the mists of time. Take this signpost for example: Jesus said that when the temple fell, “the sun will be darkened, and the moon will not give its light” (Matt. 24:29). What was he talking about? Lacking a frame of reference we supply our own. “Jesus was talking about astronomy.” Nope. Jesus was describing a political event using the same language adopted by Old Testament prophets such as Isaiah (13:10) and Ezekiel (32:7). He was saying the lights were about to go out on Jerusalem and the old temple system. This interpretation would have been perfectly obvious to a Jew raised on the Jewish scriptures (the Old Testament). I am looking forward to the future return of King Jesus and the rapture of the church, but I am regularly dismayed by the way many Christians are duped by bogus end times’ prophecies. Last year several prominent ministries predicted that “something big” would happen in September 2017. Few actually said Jesus would return or that we would be raptured, but those are the sorts of things implied by “something big.” It was an exciting prophecy, repeated countless times on social media. Yet September came and nothing happened. Jesus did not return. There was no rapture, no antichrist, no Armageddon. The prognosticators were wrong. This should not surprise us. Those who force-fit contemporary events to scriptures meant for another generation are wrong 100% of the time. Yet the market for bad predictions thrives because people love this sensational stuff. Write a book on blood moons or make a rapture movie and you’ll find a ready audience. In the absence of good prophecies, bad ones thrive. It is not my intent to badmouth anyone, but if we spent as much time studying the prophecies of Jesus as we did listening to end times’ doomsayers, we wouldn’t listen to end times’ doomsayers. If we were better acquainted with the truth of what Jesus said we would not be conned by eschatological hucksters. People hijack or misinterpret Christ’s prophecies because they don’t know history. Their ignorance of the past leads them to make wrong predictions about the future. Christ’s prophecies save lives, but bad prophecies hurt people and embarrass the church. 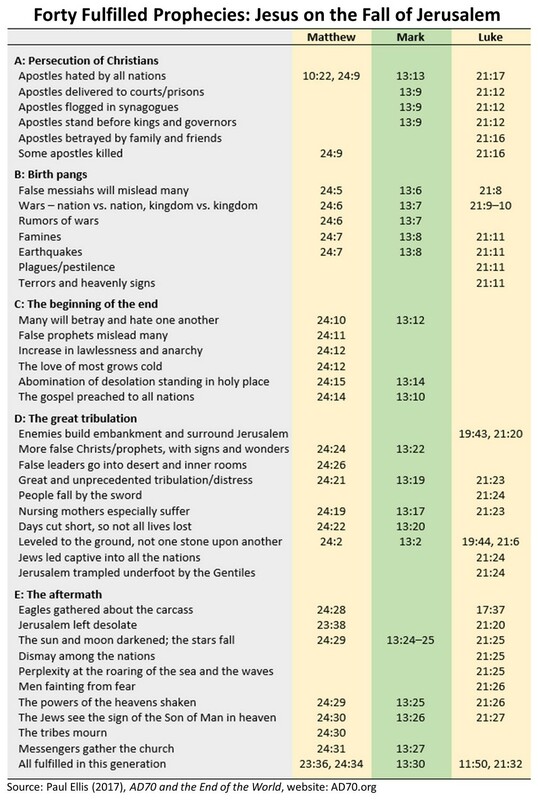 To help you tell the difference, here is a table listing 40 fulfilled prophecies made by Jesus in connection with the destruction of Jerusalem. (Click the image below for a larger version.) The stories behind each fulfilled prophecy, along with citations to the original source material, can be found in my AD70 book. I encourage you to check them out. The stories are stunning and will leave you in awe of Jesus the Prophet. These 40 fulfilled prophecies are a sign to make you wonder. Eusebius, the father of church history, said they were “truly divine and marvelously strange.” They are proof that the Son of God sees the end from the beginning. But more than that, they reveal the caring heart of Jesus. 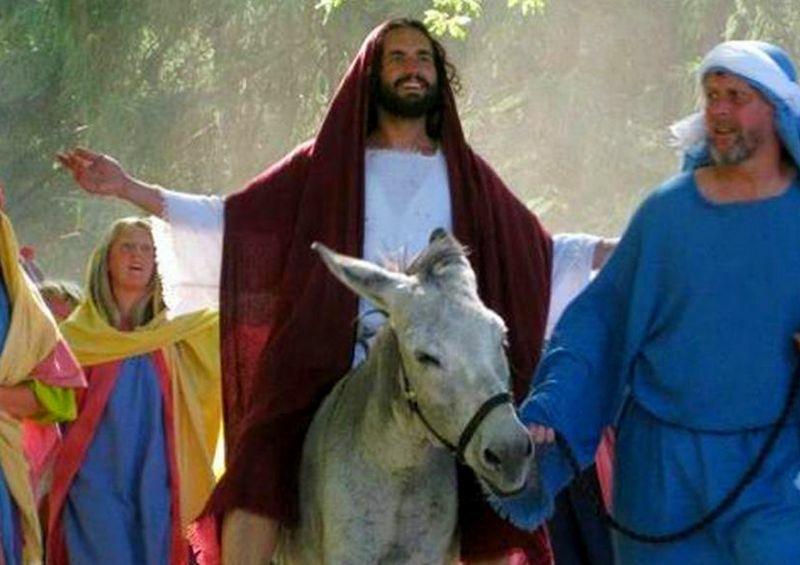 Jesus could have said nothing about Jerusalem’s dark future. He could have come and died on the cross and left it at that. But as he wandered the streets of Jerusalem, a great ache caused him to speak up again and again. Even as he bore the cross to Calvary he stopped to prophesy about the tragedy he saw coming (see Luke 23:28-29). “Pretty table, Paul. But I don’t believe these 40 signs had anything to do with the fall of Jerusalem.” You have the luxury of believing that, but first-century Judeans who dismissed the 40 signs paid a high price. Within 40 years, every one of the Lord’s 40 prophecies had been fulfilled. Those who heeded them lived; those who didn’t died brutal deaths. The 40 fulfilled prophecies were for then, but they also encourage us now. These ancient prophecies leave us in awe of a good Savior who cares enough to speak into our lives. Here’s the lesson: Those who hear and believe Jesus will live. It was true then and it’s remains true today. Want to see these good news messages reach more? Support us on Patreon. Great word! I believe these so call prophecies and end times predictions are what John was talking about in 1 John 2, 4 about the spirit of antichrist…these do nothing but distract from the wonderful and soul-freeing message about the grace of God and His never ending love for us, as well as our (the churches) ministry of reconciliation to proclaim the good news of the gospel of Jesus Christ! Instead they talk (if at all or at least imply) about Jesus as if He left something unfinished and WE will have to pay for it and somehow our loving heavenly Father has a separate agenda from the finished work of Christ–absolute nonsense. Wow, this stuff gets me riled up!! I have spent over 50 year watching the church be led astray with this junk…thanks for all your hard work bringing the truth. It gets me riled up too, Mark. So much time and energy has been wasted through these distractions and we are oh-so slow to learn. Yes! “Distract from the wonderful message “ well put. I was told yesterday again ( by my mom, who so looks forward to the rapture) that I am deceived, because I was speaking about the goodness of our father, and that he doesn’t have an agenda to destroy the wicked during the tribulation coming soon. It’s so obvious once you see it. I’m so grateful for teachers like Paul here, who have been in cooperation with the Holy Spirit in opening my understanding to this! Excellent! Thank you very much !!!! This analysis is spot on. Our ignorance of Old Testament terminology leaves the door open to incredibly bad theology. The worst is probably 2 Corinthians 12:7 (Paul’s “thorn in the flesh”). How many Christians understand this in the context of Numbers 33:55, or the three times Paul prayed in the context of Acts 13:46, 18:6 and 19:9? Thanks for preaching truth, Paul. Keep up the good work. Thanks for the comment and for spotting the typo. Your writings are so encouraging to me. I also listen to Pastor Prince, and you two always leave me encouraged, and wanting to hear more about Jesus. Keep up the good work! Paul, could the answer to your opening question be both (a) and (b)? The term “Son of David” is a messianic reference. Reading on in the next chapter, the Pharisees were questioned about the Christ, “whose son is he?” They understood the term. The One Only Yahuah (GOD)… (Ex 3: 13-15) What & Who is in a name? What would happen if we were better acquainted with the truth of, “What is the Name above all names?” Is it natural [one half of the base meaning of “intrinsic”] to obey & then, on the path of life, learn to trust Yahuah? No, it’s not; we are told to trust & obey but when one puts this to prayer, asking for understanding from Wisdom – I for one “see it” the opposite way round. If we could only get to a place where we choose not to follow wo(men) – Would we care enough for history to learn & know the meaning of the prophecies spoken by Yahusha (the son-man Chararcter & Person of the One Yahuah)? Follow only the example of the Character & Person (son) of the One Only Yahuah – Yahuah provided Himself to us in the flesh; to point us to Himself. Following wo(men) of the ilk of those mentioned in this post is no different than following others. The traditions of wo(men) are what Yahusha (the son-man) warned us of when He scorned the leaders in His day, re: “… by your oral written rules (penned or otherwise) – you keep the people from coming to me & you yourselves don’t have the courage to approach me either…” This type of believing & following results in death, not life. Paul, thank you for this teaching on end time prophecies. Today there are many so called prophets that are teaching people that these 40 prophecies are part of the present time messages predicts what must happen hereafter. What do you say about this? I have quite a lot to say about this and I say it all here. Hi Paul, God Bless you and keep you, the Lord raise His countenance over you and be gracious unto you, The Lord turn His face towards you and give you peace now and forever more. thanks for this awesome exposition. keep it up. you just bless my soul and my yawning. So when the disciples asked about the end times, Jesus actually was talking about A.D. 70? I’m confused because I thought the prophecies were written for this day and age. When the disciples asked Jesus about the fall of the temple, he told them about the fall of the temple. And when they asked him about his return, he told them about that too. Some prophecies have been fulfilled (the temple was destroyed in the summer of AD70); others are yet to be (Jesus had not yet returned). I read it and seeking 1st the kingdom of God. I am a recent hypocrite(backslider) who has been born again. If it’s not one thing; it’s another that has taken me out. I was saved August 1st 1985 and my beautiful wife August 9th 1985. Since then, we have weathered many storms. We have raised 4 beautiful kids and now 5 grandchildren. We both have struggled in the area of common temptations and old habits learned very young. In my opinion our marriage(33 years September 19th)is a miracle. Most people have been taken out with a lot less. I can’t shares details but, all things are naked and open before the Lord. He knows! I felt led to share this. 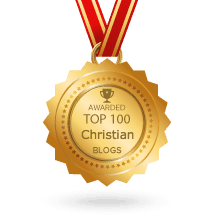 We both as I wrestle with guilt and shame sometimes for places we’ve been even as Christians. Pray a sincere prayer for us. I have love in my heart for All people regardless of their sin and by the grace of God led many to the Lord. In conclusion, I had no intention of saying all this but, felt led too….God bless! Paul, my brother. I love you man! Every time I crave a pure unmuddied drink of refreshing Grace-water, I know I can come to E2R and be blessed with a clear view of Jesus, our King. “Those who hear and believe Jesus will live. It was true then and it remains true today.”… Amen! Just think, the blazing, glorious love of our heavenly father is continuously beaming right at each one of us and all that stands in the way of benefiting from this great love is our beliefs. The strategy of evil is not aimed at getting us to sin, but at make sure we do not believe Jesus and exercise faith in Him. Because when you do activate the flow of God’s gracious love to you by simply starting to believe how good He really is and what was accomplished through Christ’s work, get ready – because it begins an explosive chain reaction of wave after wave of Grace that will radically change EVERYTHING about you, including your appetite for sinful activity. That’s what Satan wants to keep from happening in our lives. And he does it by keeping the truth of God hidden from our minds. New Covenant obedience is not refraining from sin. Rather, it is not believing the devils lies anymore about God’s view of you and instead believing Jesus, who spoke of and demonstrated God’s amazing love to us, and employing faith in Him (through our raised spirit man) as a replacement for works (through our dead fleshly/natural man). Obviously, obeying the New Covenant Way results in the byproduct of less and less sinning (Galatians 5:16-18), but trying to resist sin is not the starting point of living this “new life”. Thanks Jason. I love what you wrote. My comment at the end of this paragraph in parenthases of your article needs to be dwelled upon in the Spirit of the Lord. Selah! These days just about anyone can call themselves a prophet and we don’t think much of it. But in Biblical times there was a high standard: To be a prophet of God meant prophesying with 100% accuracy (Deuteronomy 18:20-22). If someone prophecies or foretells an event that doesn’t come to pass, they weren’t speaking for God, because God never lies. As always, I Love your writings. What about “the gospel preached to all nations” part? Gospel wasn’t preached to all nations before the destruction of the temple. So it wasn’t fulfilled? I don’t get it. Jesus prophesied that “this gospel of the kingdom shall be preached in the whole world as a testimony to all the nations” (Matt. 24:14). The sign was the gospel being preached in the whole world. Let scripture interpret scripture and you will find none other than the Apostle Paul claiming the prophecy had been fulfilled. “Preached in the whole world,” means preached beyond Judea. It means the first-century Roman world. If the Apostle Paul was right – and his words are in the Bible – this prophecy was fulfilled when Jesus said it would be, i.e., within a generation.